Creative ladies know that one of the smartest ways to stretch their fashion dollar is to make accessories that go with everything. That's what this simple collar does. You create it from wire. 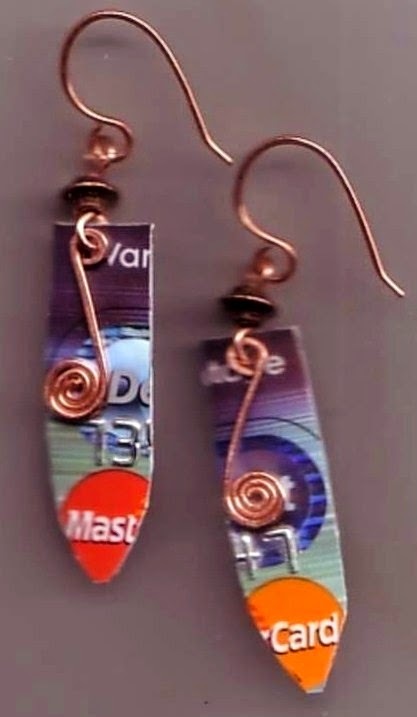 When you're done, you'll have a piece of jewelry that can be jazzy, artsy, funky, cool or whatever you choose. All you'll have to do is add the dangly thing of your choice. The material list for your collar is simple as well. You need wire and that's it, and you won't have to spend all day making it. If you're a crafty lady who is even slightly handy with jewelry-making tools, your collar should take no longer than 30 minutes from start to finish. 16 gauge Wire of your choice - If you love silver, you already know that sterling prices went through the roof a few years back; and they've yet to come down. Why not use steel instead? Gold and gold-filled wires are no bargain either; but brass can be a handy gold-toned substitute. If you want a look that says Mother Earth, try copper. You'll find all three types of wire in many local hardware stores. 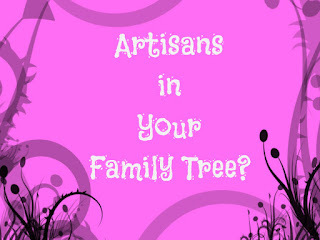 It will cost 7 dollars or less, and you'll have plenty left over for the next project. Cut one piece of wire 18 inches long. Mark the halfway point (9 inches) with a marker. Place pliers at that point and bend wire to a sharp angle. 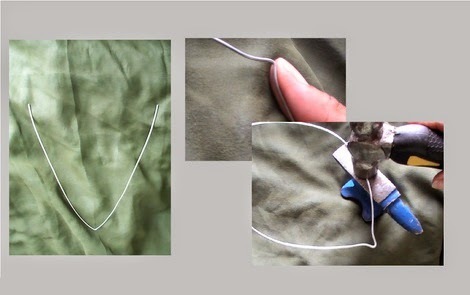 Use your thumb to curve both sides of the wire just above the angle. Curve the ends around a coffee can to give the collar a rounded shape. 16 gauge wire is thick. The curves you make will be springy and they won't be as small as the can you used to curve it. Use a hammer and block to hammer your collar. Hammering is optional, but if you choose to do it, it will harden your collar and help it to hold it's shape. Be careful not to hammer it too hard. The wire may become too flat and weak. If hammering distorts the shape, use your fingers or your coffee can to gently reshape it. If you hammer the ends, they will flatten and take on a rounded look. File the ends to remove any roughness that might scratch your neck. Your collar may appear small, but if you open it gently and slip it on, it should fit your neck. 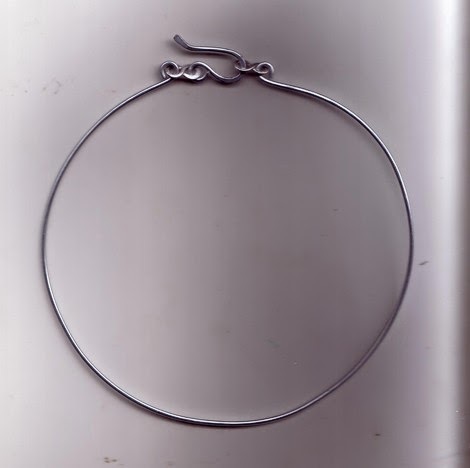 The stiffness of the collar should hold it into place, but if you prefer added security, add a shepherd's hook clasp. 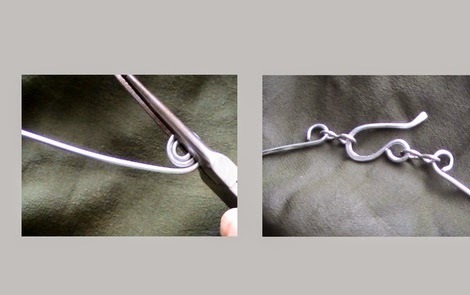 For instructions, see "3 Simple Wire-Working Jewelry Making Secrets..." Create two small figure 8s to attach your clasp. For a collar that's even more basic, make it round. Cut a 16 inch piece of wire and shape around a coffee can. Hammer it if you choose. If that's too simple for your sense of style, add a shepherd's hook clasp for a hint of detail. 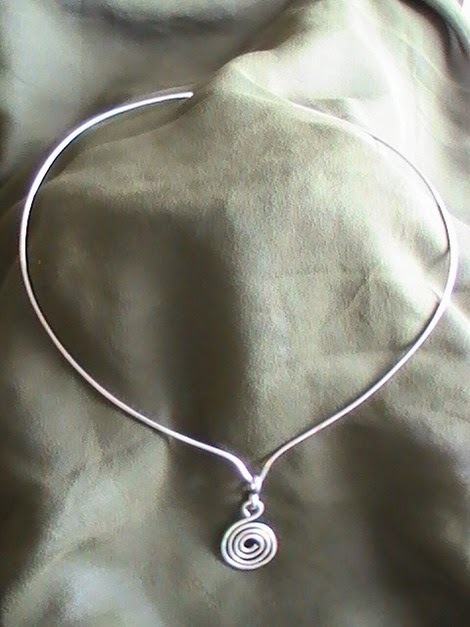 Dangle anything you want from your collar: a wild wire pendant or a single bead. You don't have to add anything at all if you don't want to, and it will be just fine.